by Scotland's Colin Hunter McQueen. 'The Phrenological Dreamer: The Popular Medical and Fictional Writing of Robert Macnish (1802-1837)', in The Proceedings of The Apothecary's Chest: Magic, Art, & Medication, The University of Glasgow, 24 November 2007 (Newcastle: Cambridge Scholars Press). 'Disembodied Souls and Exemplary Narratives: James Hogg and Popular Medical Literature', in Liberating Medicine, 1720-1835, ed. by Tristanne Connolly and Steve Clark (London: Pickering & Chatto, 2008), pp. 127-140. 'The Literary Empiricism of the Phrenologists: Reading the Burnsian Bumps', The Drouth, 30 (Winter 2008), pp. 69-77. 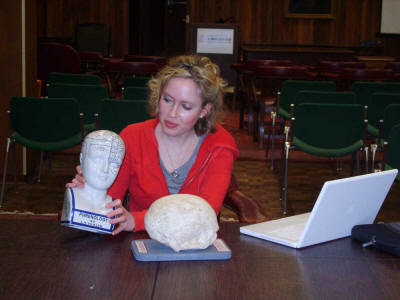 Megan with the replica of Burns skull presented to Dr. Ross Roy by Scotland's Colin Hunter McQueen. Dr. Roy brought the skull back on his last trip to Scotland. On the 8th of November 1830, Dr. Disney Alexander, physician to the General Dispensary, and the Pauper Lunatic Asylum, in Wakefield, read an essay before the Glasgow Phrenological Society. The paper was on the phrenological development of the poet Robert Burns, and Dr. Alexander illustrated 'his opinions with the incidents of his life, and numerous passages from his writings.’ This analysis predates the postmortem phrenological examination of Burns's skull by nearly four years. No record of the content of this essay has survived, but the fact that such an analysis took place emphasizes, first, the high level of phrenological interest excited by the poet and, second, the dominant role of biography and literary criticism in informing the evaluation. Burns was a character very much alive in the public imagination – a natural genius, the 'heaven-taught ploughman', who was anything but an angel. The vividness of this public image made him a fascinating and strategically useful character to the phrenologists, as they sought to confirm the basic tenets of their science by establishing a correlation between the external protrusions of the skull and the character of the individual. Scotland was the stronghold of the phrenologists in the nineteenth century, and perhaps no character was so well-known to the Scots as Burns. However, the heavy reliance on narrative evidence, including biography, letters, and poetry, in reading the Bursian bumps, reveals the phrenological analysis to be a strange mutation of literary empiricism rather than an empirical science of the mind. Dr. Alexander again appeared before the Glasgow Phrenology Society on December 17th 1834 to read an essay “On the Moral Character and Cerebral Development of Robert Burns”, at which time Mr. Andrew Rutherglen donated a cast of the poet to the society. We may safely assume that his evaluation of the cast was presented as a confirmation of his prior observations based solely upon narrative evidence. Those, who have studied the subject, and who have, consequently, accustomed themselves to think phrenologically, are able, in all cases of real character, even the most anomalous, to discern that combination of the Organs, which produced the manifestations perceived: and, whenever a character is well, or accurately, defined, tho' existing merely in the Imagination of the writer, they have no difficulty or hesitation, in applying to its development the same mode of analysis. 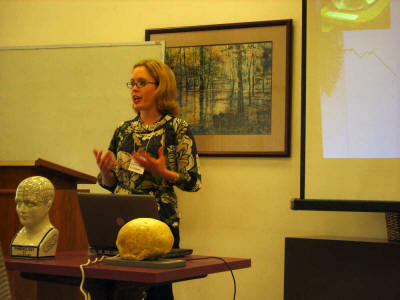 In the lecture, the works of Shakespeare are drawn upon as containing acutely naturalistic depictions of human character, and 'Phrenology is shown to be in unison with Nature, by its consistency with Nature's portraits, as drawn by this masterly hand.' The subject is not here exhausted for Alexander. He claims to have composed nine lectures on the application of phrenology to characters in Shakespeare's plays and also refers to his utilization of Shakespearean characters in what could only be deemed a game of phrenological charades to entertain some particularly lucky ladies at social gatherings! Similarly, in Phrenology in Relation to the Novel, Criticism, Drama (1848), John Ollivier writes of the ability to read phrenological character from natural artistic renderings, as 'Shakespeare lived and wrote before Phrenology was discovered, and he understood human nature as well as Mr. Combe.' Ollivier here refers to George Combe (1788-1858), the most important propagator of phrenological ideology in early nineteenth century Scotland and, as we will see, a key player in the phrenological evaluation of Burns. However, unlike the cranial refuse of capital punishment, the immortal bard's skull was not quite so easily transformed into scientific commodity. Phrenology, at that time, had not become fashionable, or rather was cultivated under a different name, and as no such opportunity can occur again, it is perhaps to be regretted that no cast was taken of the head for the benefit of the admirers of that science. But it was only a matter of time until just such an opportunity did arise, and it was McDiarmid, along with Adam Rankin and James Kerr, who was to play a key role in the macabre transactions that continue to fascinate Burnsians today. You & Sir Henry Jardins, who preserved for us a cast of King Robert Bruce's skull will be honoured hereafter for your enlightened contributions to the philosophy of mind, in these relics, while a just indignation will be dealt out to the memory of the men who buried Sir Walter Scott's skull without permitting a cast to be taken, & who spread unfortunate reports that his brain was small. Ideality, Cautiousness, Concentrativeness, and Causality, on which in him gave the circumference of the lower margin of the hat, were all only moderately developed, and a mass of brain rose upwards into the hat & stood below it. The report that the brain “was not large”, cannot have been true. The authorial hat size controversy may well have been the inspiration for Blacklock's impromptu fashion show. However, one can imagine a self-comparative motivation as well. Who wouldn't want to know if their brain is as big as Burns's? However, if Burns's skull did not indicate a large and therefore powerful brain, the phrenological doctrines would receive a serious blow. Casts from the skull of Burns have afforded phrenologists and the Public an opportunity of testing the truth or falsity of Phrenology. The mental character of the poet are so strongly marked, and the outlines so broadly defined, that we should at once expect either a very striking accordance or discordance with his cerebral organization. A report has been widely circulated, that, long before the present cast was obtained, the phrenologists had made an imaginary bust of Burns, and adduced it in support of their doctrines. Nothing can be more unfounded. I have had applications from Manchester, Liverpool, Glasgow, Ayr, &, for Casts; but I will take time for due deliberation. The letter from Glasgow struck me as suspicious, &, though a handsome bribe was sent, I declined the offer. the size is great, so you have stated; the organs of the animal propensities are very strongly indicated, but there is an agreeably powerful development of the sentiments of Benevolence, Ideality, Wonder, & Imitation; considerable Veneration; & average Conscientiousness; so that the higher qualities were combined in burns in great vigour with the lower. The intellect is highly respectable but inferior to the feelings. He had the elements of all that is bad & good powerful, & an intellect not quite adequate to their proper control, but very nearly so. All this is the language of the cast, & I think it conformable to with his history. After 're-perusing the life of Burns', Combe finds that 'it is impossible to look on the great mass of the organs of the propensities without feeling that [blot] verse evidences a literal truth.' An official evaluation by Combe is published in the Phrenological Journal in June 1834, and this is followed in the next number by Cox's more illustrative analysis. The table below contains Combe's estimations, and these are also used by Cox in his analysis. The preferment given to the biographical evidence in Burns's case was justified by the external measurements which indicated a fairly equal balance between animal and superior moral faculties. 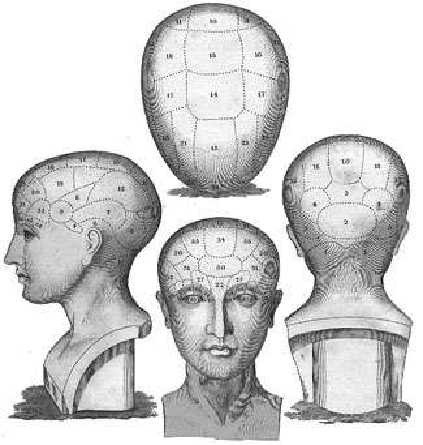 Indicative of the continued currency of the medieval concept of 'The Great Chain of Being' into the nineteenth century, the phrenological organs were divided into those faculties shared by both humans and lower animals and those unique to mankind. The propensities, such as 'Amativeness' (organ of sexual passion), 'Adhesiveness' (organ of attachment), and 'Combativeness', and the inferior sentiments, such as 'Love of Approbation' and 'Self-Esteem', were common to both man and beast, as were the intellectual faculties, which allowed for a functional relationship with the external environment. For example, the phrenological writer, Robert Macnish, notes that 'Love of Approbation' is 'active in the monkey, which is fond of gaudy dresses.' The superior sentiments distinguished man as a moral being, and included such faculties as 'Benevolence', 'Veneration', 'Firmness', 'Conscientiousness', and 'Hope'. In some persons, the animal propensities and inferior sentiments might be so predominant as to render them innately unfit to function in civilised society – a broad-based skull, indicating large animal propensities, was a red flag to steer clear. In contrast, the moral sentiments might predominant to the extent that a person could not help but live a righteous life. However, the vast majority of persons fell into a third category, in that moral and animal faculties displayed a degree of balance and hence produced conflicting emotional responses. Such persons are characterised by Cox: 'In the heat of passion they do acts which the higher powers afterwards loudly disapprove, and may truly be said to pass their days in alternate sinning and repenting.' The behaviour of such persons was particularly susceptible to external factors, and such was the case of Burns. Thus, within the construct of a potentially biologically deterministic evaluation, the moral indiscretions of the bard are in fact externalised. Notwithstanding the licentious tone of some of his early pieces, we are assured by himself (and his brother unhesitating confirms this statement), that no positive vice mingled in any of his love adventures until he had reached his twenty-third year. If he had been placed from infancy in the higher ranks of life, liberally educated, and employed in pursuits corresponding to his powers, the inferior portion of his nature would have lost part of its energy, while his better qualities would probably have assumed a decided and permanent superiority. But all the faculties of Burns's mind were, as far as I could judge, equally vigorous; and his predilection for poetry was rather the result of his enthusiastic and impassioned temper, than of genius exclusively adapted to that species of composition. From his conversation, I should have pronounced him to be fitted to excel in whatever walk of ambition he had chosen to exert his abilities. He was possessed of the passions and impulses of the most powerful man, and yet at the same time was endowed with the delicacy and intensity of the most refined woman, while he also had highly elevated moral principles and superior intellectual faculties. Burns, in fact, was the most thoroughly universal man who had appeared since the days of Shakespeare. “Owre fast for thought, owre hot for rule,” running “life's mad career wild as the wave,” refers to his large and very active propensities. His large self-esteem and love of approbation are shown - “Owre blate (too modest) to seek, owre proud to snool.” His large social and domestic feelings, which “keenly felt the friendly glow and softer flame.” We have his moral feeling and mental powers indicated - “Can others teach their course to steer” - “quick to learn and wise to know.” The warning in the concluding stanza - “Know, prudent, cautious self-control is wisdom's root” - shows great benevolence, and consciousness of low firmness, which his skull indicates. Clearly the continual appeal to poetry to confirm the cranial measurements can lead to a reductive reading of Burns's work, but, at the same time, and perhaps most overtly in Jackson's evaluation, Keats's notion of 'the cameleon art' of poetry is very much alive, as through his strong endowment of all the mental faculties, Burns could presumably step into the proverbial shoes of the other with natural ease. This evaluation does accord with John Wilson's literary assessment of the genius of Burns published in 1819 in Blackwood's Edinburgh Magazine, in which he writes 'that it was often the consciousness of his own frailties that made him so true a painter of human passions'. At this hour the name of Burns is in every man's mouth, his praise is on every tongue; the present may, therefore, be deemed an unsuitable time to ask a study of his character, - the festive rather than the scientific commanding popularity. Yet we make no apology for the publication of the following Essay: it can speak for itself now, and will bear to be investigated and contemplated in a time of calmer leisure. Indeed the providing of a worthy memorial of the great bard, which, with its other qualities, has this to recommend it, that its material is drawn from a reliable source, and its deductions directed by science [...] To set forth the true character and depict the numerous phases of a life such as that of Burns, is work for a philosopher – but without a correct philosophy no sage could be successful in it. 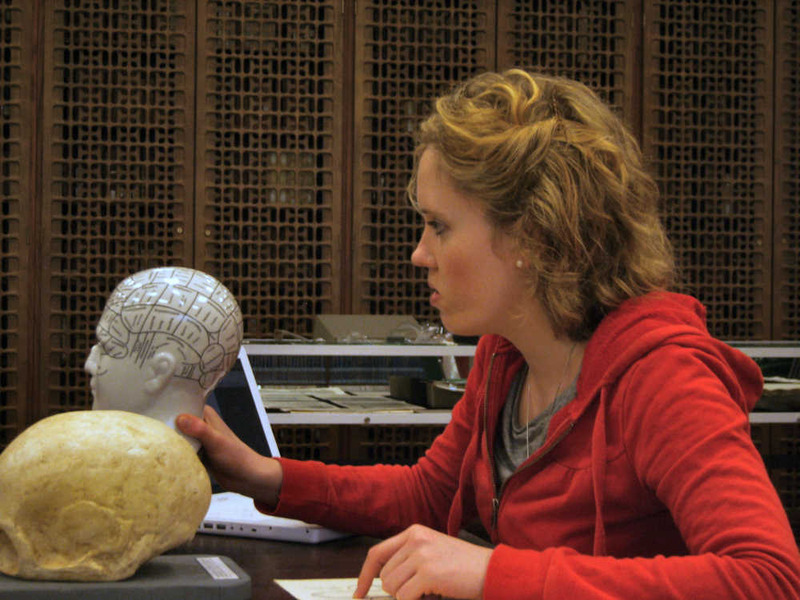 Today, phrenology is relegated to the lower divisions of the history of science – as an embarrassing, yet still amusing, methodological dead-end – an open invitation for quacks at best and racial imperialists at the very worse. However, the phrenological analyses of Burns stand out as uniquely representative of the fluid exchange, and all-in-all, the lack of a real distinction, between literary and scientific thinkers in the early nineteenth-century. Rather than simply providing a scientifically informed character study of a man who happened to be a poet, the first analyses by Cox and Combe sought to utilize the strength of the public image of Burns to forward the authority of the foundational tenets of their celebrated new science of the mind. But in this case, the solidity of the skull was read through, rather than against, the vivid spectre of Robert Burns. Megan delivering her paper at the University of South Carolina's April conference on Robert Burns. 'Proceedings of the Glasgow Phrenological Society', Phrenological Journal and Miscellany, 7 (1831-2), p. 191. Disney Alexander, 'A Lecture on Phrenology, as Illustrative of the Moral and Intellectual Capacities of Man' (London: Baldwin, Cradock and Joy; Edinburgh: John Anderson; Wakefield: J. Stanfield, 1826), pp. 4-5. John Ollivier, Phrenology in Relation to the Novel, the Criticism, and the Drama (London: 1848), p. 55. Robert Cox, ‘An Essay on the Character and Cerebral Development of Robert Burns. Read, on 5th May 1834, before The Edinburgh Ethical Society for the Study and Practical Applications of Phrenology.’ Phrenological Journal and Miscellany, 9 (1834-6), 52-74, (pp. 52-3). John McDiarmid, 'St. Michael's Church-Yard – Disinterment of Burns' in Sketches from Nature (Edinburgh: Oliver & Boyd; London: Simpkin & Marshall, 1830), pp. 367-380, (p. 377). Mark Fraser, ‘The Phrenologists and Robert Burns’, Burns Chronicle (1996), pp. 215-221. Letter from John McDiarmid to George Combe, dated 23 April 1834, NLS MS 7233, ff. 1-2. All quoted manuscripts are from the Combe collection in the National Library of Scotland (NLS). Many thanks to the Trustees of the National Library of Scotland for permission to quote from these sources, and many thanks to the British Association for Romantic Studies for funding my work at the NLS with the Stephen Copley Postgraduate Research Award. Letter from George Combe to John McDiarmid, dated 5 April 1834, NLS MS 7386, f. 117. George Combe, Journal of 1857-8, NLS MS 7432, ff. 62-3. 'Phrenological Development of Robert Burns', Manchester Times & Gazette, 12 July 1834, Issue 298. Cox, 'An Essay on the Character and Cerebral Development of Robert Burns. ', p. 53. Letter from John McDiarmid to George Combe, dated 23 April 1834, NLS MS 7233, ff. 1-2. Letter from George Combe to John McDiarmid, dated 20 April, 1834, NLS MS 7386, f. 120. Letter from George Combe to Archbishop of Dublin, dated 5 May 1834, NLS 7386, f. 131-2. Robert Macnish, An Introduction to Phrenology (Glasgow: W. R. M'Phun, 1836), p. 59. Cox, 'An Essay on the Character and Cerebral Development of Robert Burns. ', p. 57. Macnish, An Introduction to Phrenology, pp. 27-8. Cox, 'An Essay on the Character and Cerebral Development of Robert Burns. ', p. 60. Frederick Bridges, 'The Phrenological Characteristics of Robert Burns, the Poet', Liverpool Mercury, 27 January 1859, Issue 3416. Nicolas Morgan, 'The Scottish National Poet', The Alderman, 4:97 (26 January 1878), p. 5. Many thanks to Kathleen Struck of the Heckman Library, Calvin College for providing me with a copy of this article. George Combe, ‘Observations on the Skull of Robert Burns’, Phrenology Journal and Miscellany, 8 (1832-4), pp. 756-662, (pp. 661-2). Cox, 'An Essay on the Character and Cerebral Development of Robert Burns. ', p. 59. John Wilson, 'Some Observations on the Poetry of the Agricultural and that of the Pastoral Districts in Scotland, Illustrated by a Comparative View of the Genius of Burns and the Ettrick Shepherd', Blackwood's Edinburgh Magazine, 4:23 (February 1819), pp. 521-9, (p. 527). A. Stewart, 'Publisher's Preface', in 'An Essay on the Character and Cerebral Development of Robert Burns, by Robert Cox. (Reprinted from the Phrenological Journal for September, 1834) With Observations on the Skull of Burns, by the late George Combe.' (Edinburgh: A. Stewart, Phrenological Museum, 1859), pp. 3-4.